A new series is about to launch on APTN that will highlight just how successful Indigenous people have been at waging war. The series, which begins this September, is called Nations at War, and is based on real accounts of various conflicts throughout history right up to the modern day. Many of the conflicts examined dealing with encroaching European settlement, or disputes with the Canadian government, but the series begins with an account of the mighty Haida Nation and the military tactics they used for centuries until the 1800s. “The key thing about this program is it’s very educational… Everybody who worked on this show, including myself… every day we were learning something about different Nations or alliances that were happening, because we were taking parts of history and presenting them with visuals,” said Jason Friesen, writer, director, and producer of the series. Friesen worked intensively alongside Tim Johnson, also a writer and producer for the series. Johnson also came up with the series’ concept. The pair received assistance from Bonny Lou Wagner, the co-director of the first three episodes. Action packed adventures fill each episode, according to Friesen, and the scenes are dynamic and engaging. But it was the special groundwork he and Johnson undertook to make it factual that Friesen finds most powerful. “We did it with CGI (computer-generated imagery), visual effects, and re-enactments. And the other thing is, to compliment the history, we have scholars on board, and we have Elders from different communities. We have a lot of really nice interviews,” said Friesen. Nations at War has 13 half-hour episodes in total, and David H. Lyle is the host of each one. In addition to the Haida Nation episode, there are also episodes featuring the Métis resistance with Louis Riel, including the Northwest Rebellion of 1885; a conflict between the Nlaka’pamux and American miners in 1858; Norse Warriors (Vikings) in 1000 CE who meet with “a mysterious Aboriginal Nation” known as the Skraelings; the Mi’kmaq conflict with the British in 1749; and the Blackfoot Confederacy in 1738 fighting to protect the herds of buffalo they relied on for their survival. These are just a few of the episodes that will premiere on APTN W and APTN E Sept. 6, and APTN N Sept. 12. “When you hear different Elders and Aboriginal experts speaking in the series, it becomes more exciting because they’re giving anecdotes of what they were told by their Elders,” said Friesen. “Ken Prudence, a Métis Elder, talks about the Métis buffalo hunt, and how and when they went on hunts they’d have a mouth full of bullets, and they’d be riding and shooting on the fly,” Friesen said. 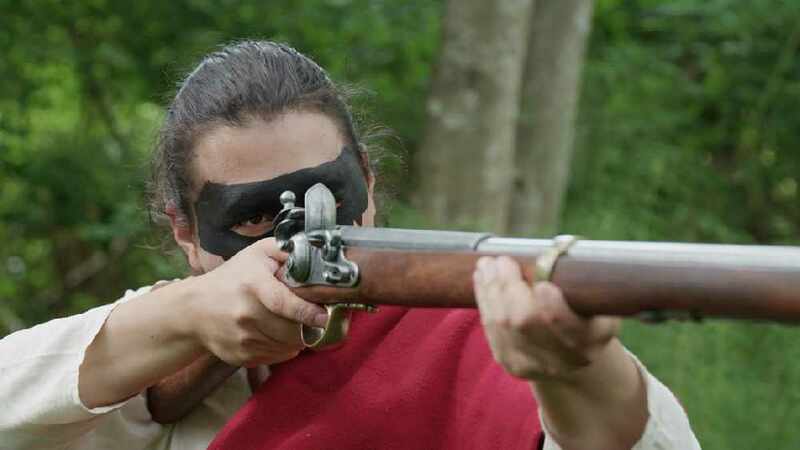 Prudence tells us that the Métis people’s incredible skill while hunting made them a formidable force when pitted against the Canadian government. It’s stories like these, that has Friesen looking forward to sharing all that he’s learned through the show, he said. Tim Johnson is equally as excited as Friesen. A self-professed history nerd, Johnson enjoyed the hours and hours of research he undertook while writing for the series. Johnson initially came up with the idea after working on a documentary about a First Nations conflict with the British in Nova Scotia during colonial times. Inspired to continue looking into First Nations history, he found these great moments of war, are actually responsible for moulding the country we know as Canada today—for better or worse, he said. “For me, every time we show people anything about the show, uniformly, we’ve got nothing but sheer enthusiasm back. There is so much history jammed into the show, very few people can know all of this,” he said. Johnson is careful to note, he and Friesen are not making a political statement with their program (and Friesen agrees to this). Instead they are taking crucial pieces of history—mostly untold or unacknowledged stories—and presenting them to people who can then make their own judgements. And because they employ so many visually engaging graphics, both Johnson and Friesen expect audiences of all ages and backgrounds will get something out of the show. Just as a side note, much of the footage was shot in B.C. “We tried to look at a piece of the puzzle and put those pieces in. We’re not making judgements because it’s hard to reach back into the past, especially over 200 or 300 years, and really concretely know anything that went down,” said Johnson. “But the more complete the picture was, the more epic it became… And we made a conscious choice to show the global impact,” said Johnson.